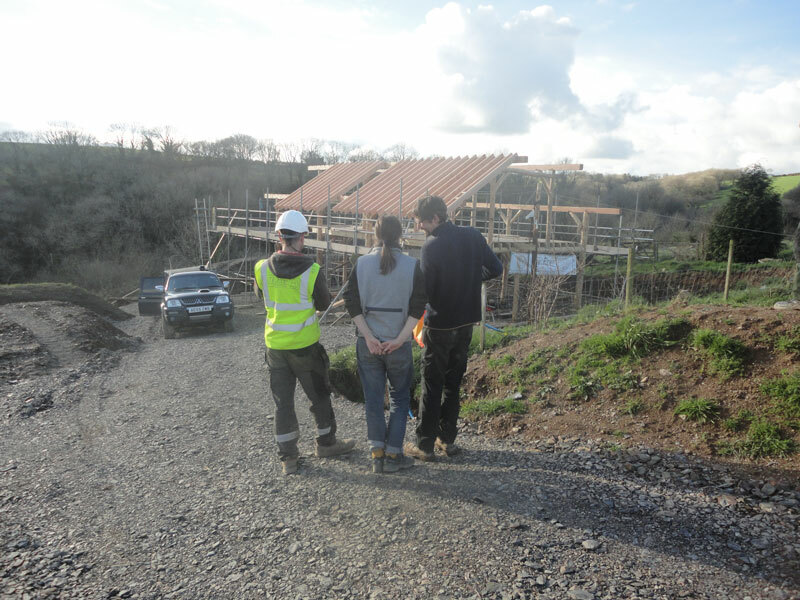 The current frame is for a family dwelling at Rhiw Las, which is a group of four low-impact small holdings in Carmarthenshire. 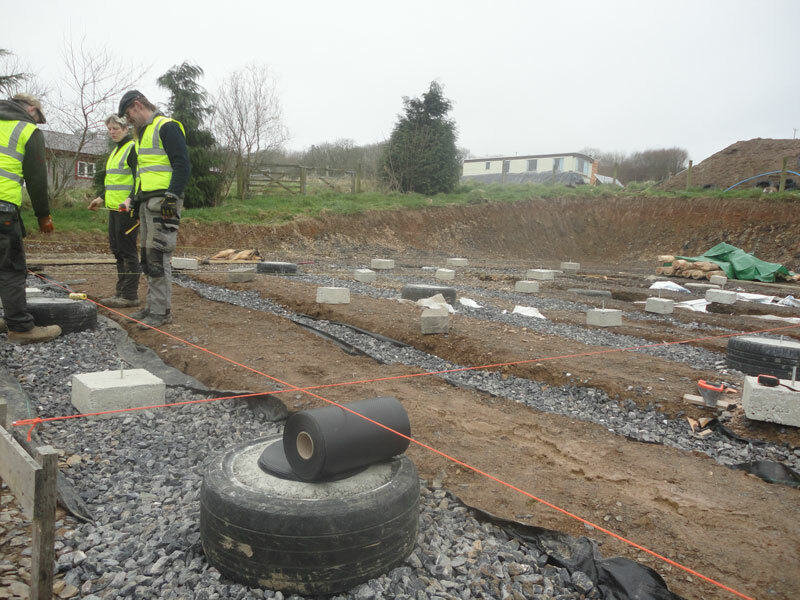 Erica and Chris have been approved for planning through the One Planet Development so a Ty Pren building is ideal for the ecological requirements. Our techniques and processes help to reduce the carbon footprint of the build. 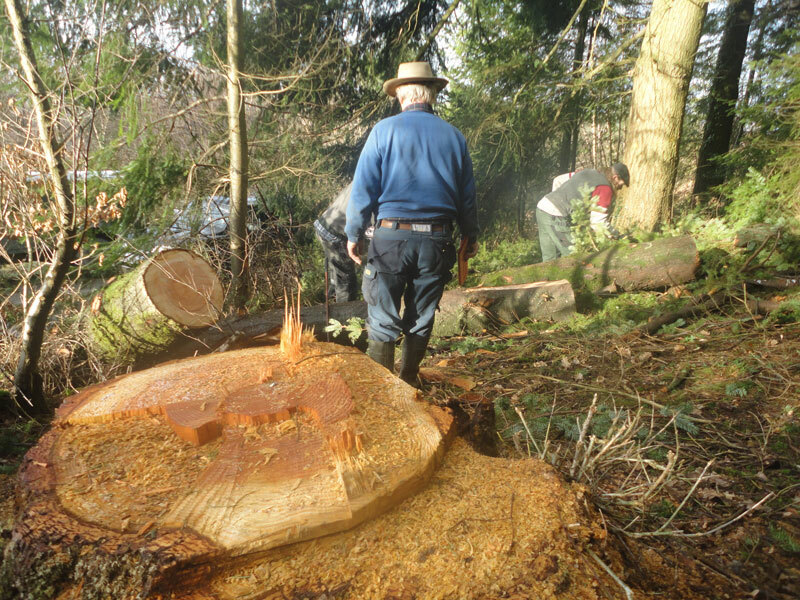 Ty Pren has been selecting, extracting and framing larch trees from the same woodland for this frame which keeps the transport costs down. 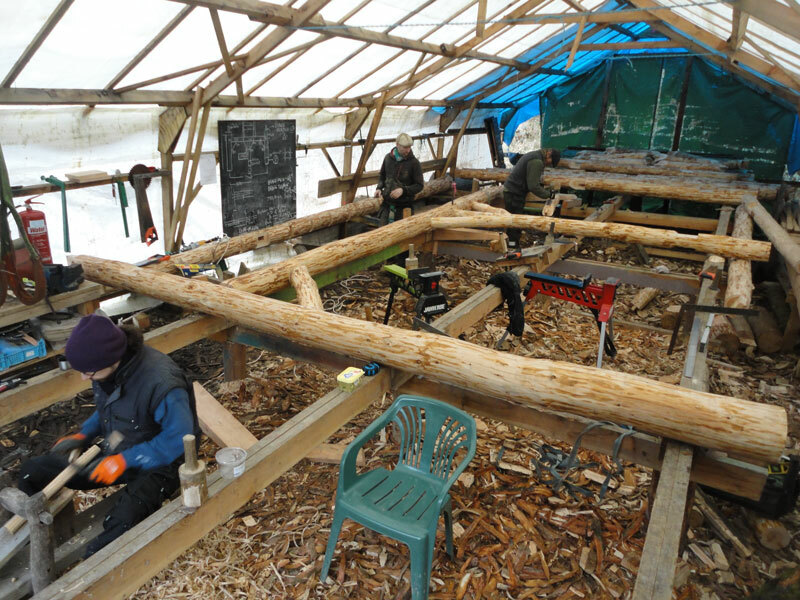 Using hand tools we have been stripping larch poles and framing them. The larch trees are carefully selected for the needs of the building. The frame is made from primarily round wood which adds extra strength to the building. The wall plates are square cut and scarved together. 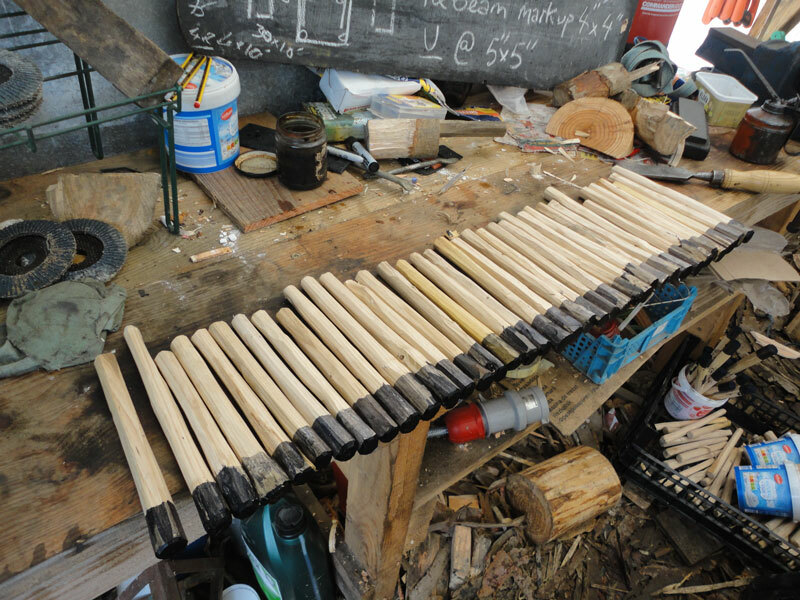 The pegs are made from seasoned sweet chestnut. 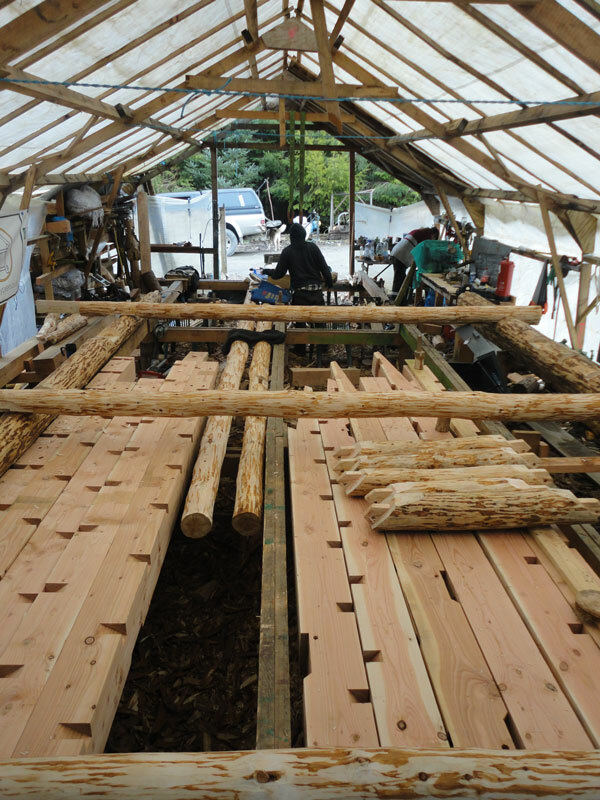 The green wood that we frame will tighten around the seasoned pegs strenghthening the joint. Some of the pegs are dyed with a solution made from vinegar and wire wool, to distinguish them from other size pegs. 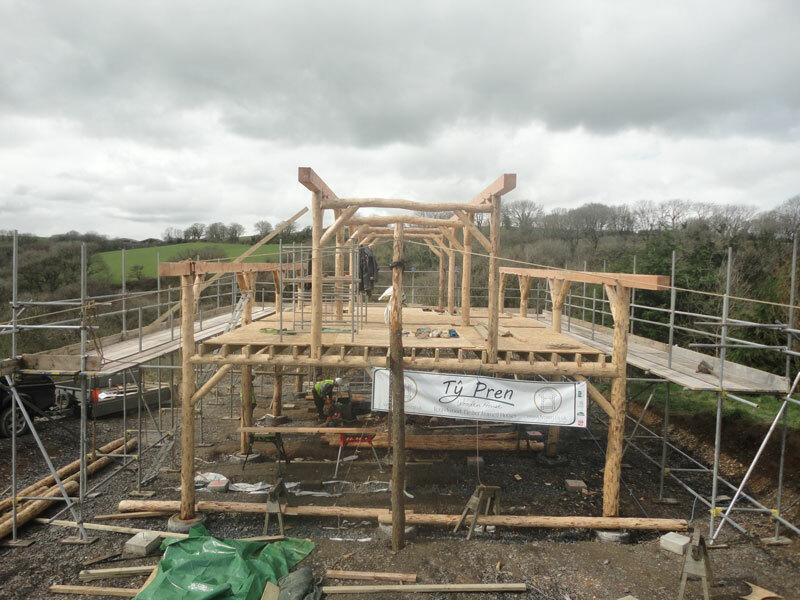 Once the frame was completed it was taken to the site in Carmathenshire on the back on a flat bed lorry ready be raised. This is the only transport cost of the timber keeping the CO2 emissions to a minimum. The frame took us all day to load and unload and stack on site. Chris and Erica had marked out the plan for the placement of the uprights. We took laser levels and were ready to start raising. 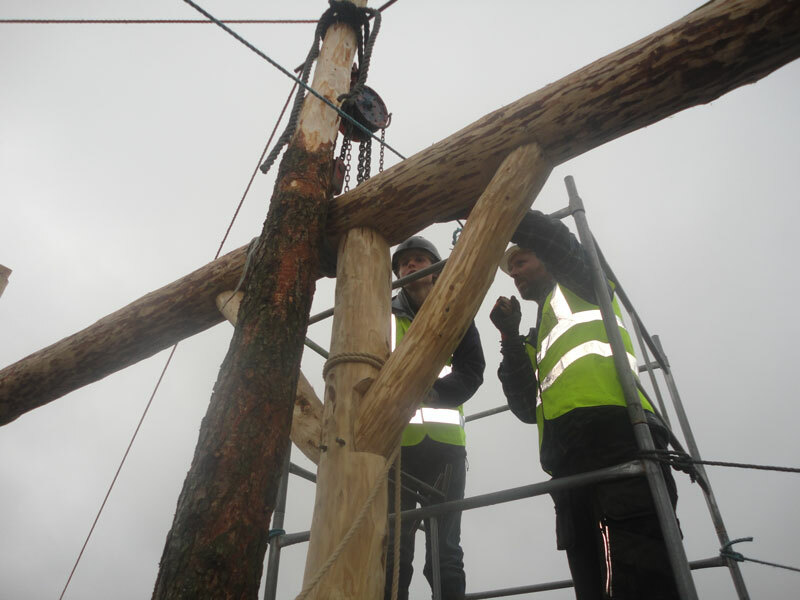 Once we had raised the first bent Erica and Chris knocked in the first pegs of the building. We have worked well as a team to raise the frame, all putting our heads together to solve any technical issues if they arose. And so the frame is raised! Prior to the rafters going on there is not a nail in the building. 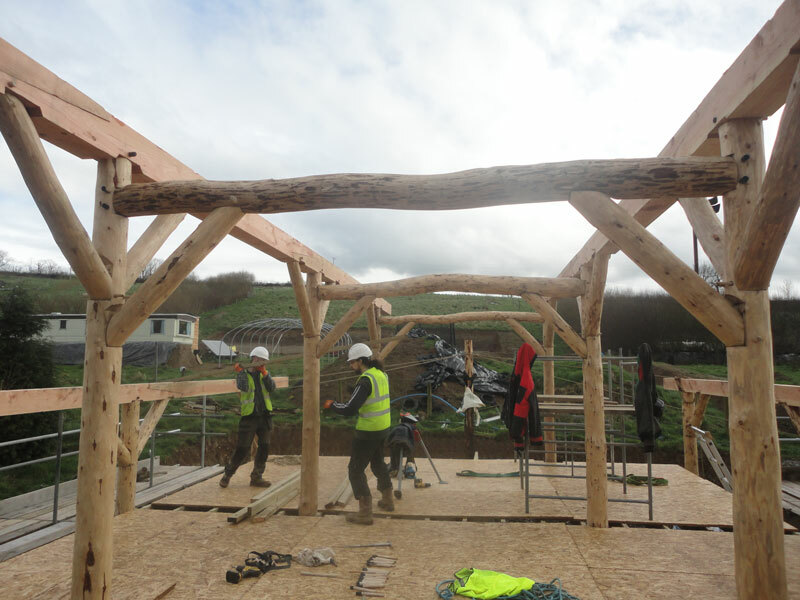 The rafters have been milled from a tree from the same woodland that the frame came from. The frame looks fantastic in this beautiful setting. The dynamics of the team have changed for this build, Ray and Blue are not currently with us . We have found two apprentices to work and learn with the team. Mark and Cathryn have worked very hard honing their skills and have been a real asset. Thank you to volunteers Emily, Lyka and Ian for helping us along with the build, your contributions were really appreciated and it was great to have you in the workshop, we hope you enjoyed your experience!